AUTOSPORT revels that Mercedes conducted a private and secret 1000 km test at Barcelona after the Spanish Grand Prix. Rival Formula 1 teams have been left with a bitter taste after it was revealed that the Brackley based outfit got an opportunity to enhance its understanding of this years tyres. Mercedes have claimed four successive pole positions but have had miserable race pace because their car cannot maintain the ideal working temperature for the tyres. Even though in-season testing is not allowed in F1 any more the tyre manufacturer reserves the right to request any team to perform tests on their tyres when circumstances dictate. Mercedes insist that they were well within the regulations to help Pirelli as they needed some mileage to understand the behaviour of the tyres. But rival teams are not buying that claim and have approached the FIA for clarification. "We found out second-hand last night," said Horner, when asked by AUTOSPORT about the situation. "We now need to deal with it through the proper channels, so that is what we will be doing. "I can understand Pirelli wanting to test the tyres, as they have obviously got issues with the tyres. What is disappointing is that it has been done in a not transparent manner. 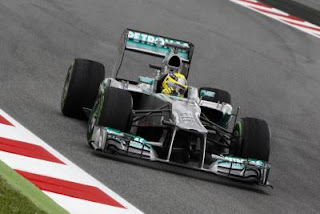 "A three-day test has taken place with a current car on tyres that are going to be used in the next grand prix. Irrelevant of what you call it, that is testing." Horner suggests that although an agreement may exist in Pirelli's contract with the teams to allow individual tests, that is not enough grounds for it to believe Mercedes was allowed to test. "I think there is confusion between what is contractually permissible and what a team when it enters a world championship is allowed to do within the sporting regulations," he said. "It is a situation that we need clarification on, so our position is we are going to request that clarification." Mercedes Team principal Ross Brawn said that his outfit had worked tirelessly on the tyre issue since Barcelona - but did not make reference to the test when asked about what the team had done since the Spanish GP. "There were a lot of things going on already, so I don't want to create the impression that we got back and all of a sudden we started work. There was a lot of work going on already.